The Syracuse University Marching Band (SUMB) has been invited to perform in the 31st annual London’s New Year’s Day Parade and Festival, to be held between Dec. 27, 2016-Jan. 3, 2017. 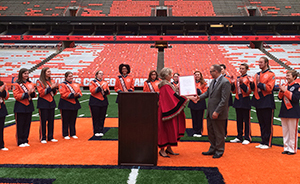 The band was officially invited by City of Westminster Past Lord Mayor Catherine Longworth, senior patron of the parade and festival, at a ceremony in the Carrier Dome on Sept. 14. According to Executive Director Bob Bone, the parade features more than 8,500 regular performers each year from around the globe. Two-thirds of a million people attend the parade, and it boasts a worldwide television audience of 300 million viewers. 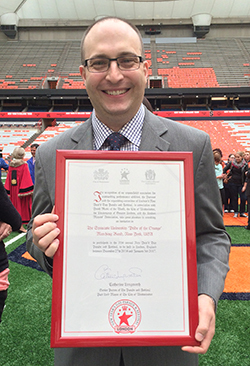 Founded in 1901 and currently housed in the College of Visual and Performing Arts’ Rose, Jules R. and Stanford S. Setnor School of Music, the SUMB performs for all home football games in the Dome and is the flagship college band in the state of New York. It also serves as a University ambassador, representing the University at major events both on and off campus. Current membership is approximately 200 students from across the University’s schools and colleges.